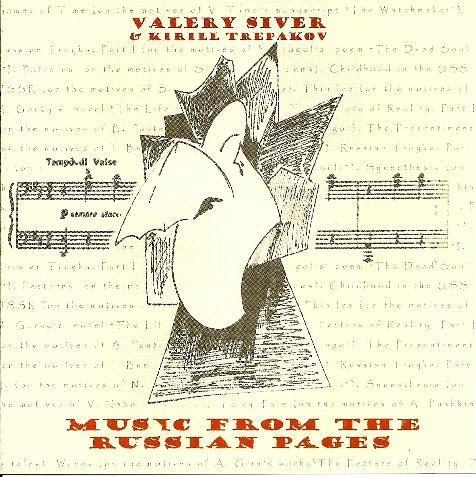 Valery Siver & Kirill Trepakov - "Music From The Russian Pages"
It would be difficult to overstate the contribution and influence of Russian writers and poets to literary history. Music From The Russian Pages is the second collaboration between Valery Siver and Kiryll Trepakov for the Electroshock label. The theme of the album seems to be either homage to, or questioning of, Russian literary figures. Each of the 12 tracks is sub-titled on the motives of… some writer. For example, Games of Time is followed by (on the motives of V. Tumo's manuscript "The Watchmaker), and Synesthesia is followed by (on the motives of V. Nabokov's works). You get the idea. Utilizing guitar, piano (Siver), electronics, keyboards, and bass (Trepakov), the musicians have created of set of instrumentals that are spacey, jazzy, ambient, and electro-dance influenced. Among my favorite tracks are Russian Troyka Parts I & II. Part I features simple but entrancing guitar patterns, electro beats, and well placed percussion and scratching effects, while Part II features more of the same but picks up the pace, being a cosmically mind-bending dance instrumental. Another highlight is The Fetters of Reality, again in two parts. On Part I we have classical piano plus short wave radio static and alien electronics. The radio static becomes increasingly assertive as the piece progresses until finally overtaking the piano. Part II continues this theme but has a spaced out drum 'n bass vibe. The other stand out track for me is Thin Ice, which is a cool combination of simple pleasant melodies and freaky, but not in-yer-face electronics and sounds from nature. In the last minute it transitions to guitar and soundscape ambience that brings the piece to a close. Overall a very pleasant set of instrumental music. I like the way the musicians combine conventional guitar and keyboards melodies with somewhat experimental electronics and dance beats. And the excellent sound and production on this album really enhances the listening experience.